San Diego got zombie-proofed today. The creator of The Walking Dead, Robert Kirkman, unveiled his one-off Zombie Survival Machine at Comic Con to celebrate the 100th issue of his comic. If we don't mass-produce this thing the zombies will kill us all. Our old Editor-In-Chief Ray Wert is at Comic Con and stopped to take these pictures. 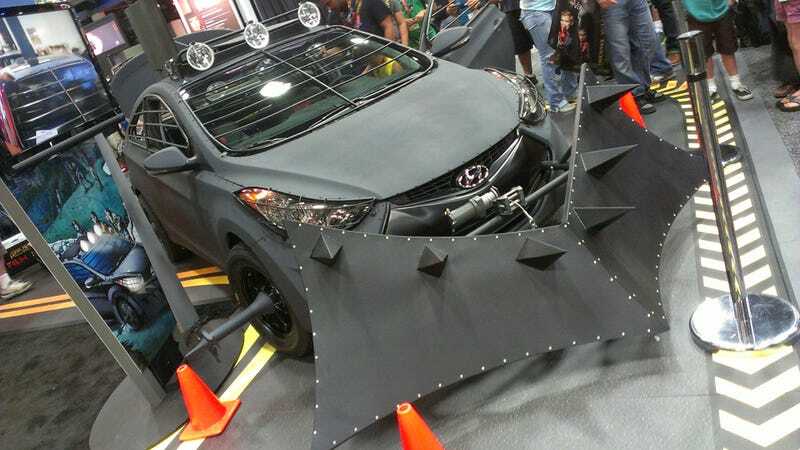 Strip off the window armor, the caged-in sunroof, the C/B radio, the cow catcher, and the off road tires and you have a fairly standard Hyundai Elantra Coupe. The thing looks so good it makes us wonder why Elantras don't come fitted with spiked cow catchers as standard. It probably has something to do with pedestrian safety standards, but we're not sure.